Steve P loves to chill-out to the comforting and relaxing sound of soothing music. He likes folk and soft blues and finds that escaping to some good music is a great way to unwind and clear the head. That said he still wants resolution, transparency, timbre and natural sound to go with the interesting music! And he loves the aesthetics of great design. Steve P: I wouldn’t say it was ‘unforgettable’ musically, but I do have fond memories of listening to music with the family in the car during long road trips. My older sisters would sing along to their favourite songs on the radio (with mum poking fun at the music & lyrics) until the airwaves started to break up and we eventually lost the signal as we headed out of Sydney. Then, out came my parent’s tapes. On the usual rotation we had - Neil Diamond, Barbra Streisand, Peter Allen, Kenny Rogers, Barry Manilow, The Bee Gees and a few others of this “calibre” (said with sarcasm). Of course it was never cool to say you enjoyed listening to these artists or that you sang along with the family to their songs, so I never will but in my defence, my siblings and I were brainwashed into liking them! Apparently I used to get car sick on some of my earliest road trips but now I’m starting to think the nausea was probably brought on by Barbra. SP: I do recall noticing the sound quality of stereo’s within the different cars my parents bought throughout the years with the Becker (?) system in the Mercedes sounding so much better than any of the others, so I guess that was the start. The real journey began when I spent my first few apprentice chef pay cheques on a PYE all in one system from Norman Ross and lovin’ it. But within a year I was already looking at more expensive systems in Grace Bros when someone I knew as a regular diner (in the restaurant I was working in) approached me. It was Gordon Stephenson of Piramai HiFi (in Burwood years ago) and he opened my eyes to the world of real HiFi with separate components and brands I’d never heard of – all offered significantly better sound than anything the box movers were offering. I spent 3 times more than I had expected on a JVC system with Aaron speakers and a C.D.C. turntable. I didn’t have the money to also get the JVC CD player at that time, although I did manage to grab it several months later. I was the first of anyone I knew to own a CDP and CD’s. 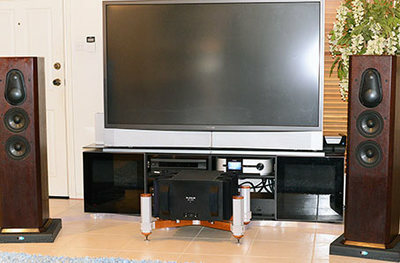 I became a regular customer to the store and ventured into AV and the many generations of surround sound, laserdiscs and so on but I would always drool over the B&W 801 speakers running on the ME1500 amp and ME pre in the main sound lounge. But being well out of my price range, it was a mere dream of me ever owning them. A few years on and I could afford an ME750 amp and when I was offered a pair of 801s that were traded in for the B&W 800s, I jumped at the chance. It was a huge financial stretch for me and would not have been possible if it weren’t for the support of the store extending me the courtesy of a very long layby, but it was worth it. SP: With an interest in hi-fi spanning almost 30 years now, I’ve gone through many upgrades and changes throughout that time, mostly on the AV side of things. So I doubt my system will ever reach a final destination. How could it with so much new good stuff coming? Even after scoring a new or long desired item that takes the system to a greater level of performance, there’s always something better that comes along and keeps you moving the goal post a little further each time. I guess I love technology and I’m excited in what advancements new gear can bring to my Audio and Video enjoyment. It’s hard to know what will be around in 10 - 20 years’ time but I can’t imagine not owning and enjoying some of it. So, where is it going? Only time will tell. SP: Not just for the financial challenge of buying them but also for the fact that I’ve had them for 22 years now; it would have to be my B&W 801 Matrix Series 2 speakers. I couldn’t part with that much history; however, I wouldn’t say they are my favourite kit at the moment. My favourite gear would have to be my Energy Veritas 1.8 speakers. These are not that well known in Australia and are quite rare here. With changes to the electronics in my system over the years, these mid 90’s built speakers continue to surprise me with their sound quality and capabilities. They won’t be going anywhere soon. TW: You really like the Plinius SA250 too. Yet it’s not your favourite? SP: Yes, it’s great. It’s taken the Veritas to a whole new level. People that heard the Veritas with other amps didn’t think they were capable of sounding as good as they do now. I think it’s amazing that even mid-90’s speakers can sound like more modern speakers when driven by a more modern amp. Maybe the speakers were ahead of their time, or perhaps my amps back then weren’t in the same league as the Veritas and didn’t allow them to open up as they do now. The Plinius sounds especially good in Class A mode, but my power bill sky rockets! So I don’t listen in Class A all the time. SP: Hard to say as there is nothing I really need at the moment. 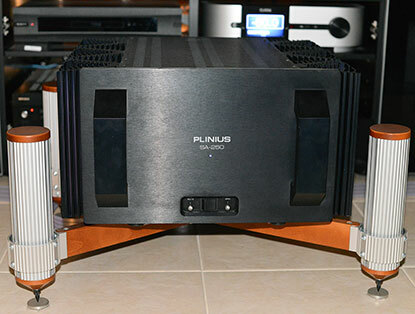 I have considered getting a high end CDP even though I don’t play CDs anymore as I prefer to use the music server, but with new players having a digital input this would give me access to another DAC and would sound considerably better than the Oppo when guests bring over their CDs to play. Something like the Marantz SA7 Mk2 with a warm and sweet sound would suit me when listening in Class AB. I’m also considering a separate DAC. Maybe the Chord Hugo, it’s great for the money. But I’ve also heard the Chord QBD76 compared to the Hugo, so it’d be hard to be happy with just the Hugo now! TW: Do you have any plans to get more deeply involved in hi-res music? SP: Yes. I’ve dabbled a bit and had hits and misses like most people. Some sound good, but just because it’s in “hi-res” doesn’t mean it’s going to sound great. If there wasn’t much care taken in the original recording then it really doesn’t matter what you do later; the hi-res version will sound compromised. There needs to be standards set in the recording and mastering processes to ensure sound quality. I guess everything will eventually go hi-res though. 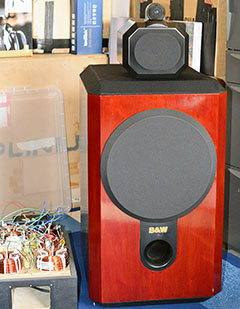 SP: Initially it was the 801 speakers until I heard the Duntech Sovereigns on ME amps. These were up on the stage of Burwood’s Westfield shopping centre playing into an open area as part of a mini HiFi demo/promo show put on by Piramai HiFi in the late 80’s. The sheer scale of the soundstage and the imaging the system achieved for such a large area was very much a wow moment and is still memorable for me. These days it would be the Kyron Gaia speakers. I like things that are different – the skeleton appearance, open baffle and exposed drivers in the Gaia all look great. The aesthetics are important to me. And of course, they sound great too. SP: Honestly, no. I never used to sell anything as most of my upgraded gear got used to create 2nd and 3rd systems for other rooms, although these days with less need and less space, I have recently sold items to help recoup some money spent on upgraded gear. What I do regret though is holding on to unused gear for too long - they end up becoming worthless and with no-one willing to take them, I end up throwing them out even though they were still working. When you move around a few times you learn to focus on what’s important to keep, and you lose that baggage. SP: Absolutely. It makes sense to me to use tracks that you really like and listen to a lot and so obviously know well, although my ‘test tracks’ will change to whatever I’m into at the time. I don’t necessarily use audiophile records. SP: I don’t really have an all-time favourite genre or artist as my musical tastes have changed over the years. There are many bands I’ve followed from their beginnings and so still follow and listen to today; bands like Foo Fighters, Linkin Park, Placebo, Muse and U2 to name a few. These days, and the older I get, I find my music choices are more about the quality and less about the noise. I’m appreciating simpler styled music – the tones of acoustical instruments and voices so I tend to enjoy settling into the rhythms and pace of folk, singer/songwriters, blues and adult contemporary music. Some artists I enjoy today are The Greencards, Angus & Julia Stone, Joe Bonamassa, The Cowboy Junkies and The Civil Wars, but I can also chill-out on electronica like Laki Mera and Honeyroot as well as the occasional jazz track. SP: Just for the record, I would go nuts on just 3 albums as I would soon get bored. For some old school tunes it would have to be: Foo Fighters – The Colour and the Shape. Something more recent: Angus & Julia Stone – By the Way. The 3rd album would be that next new album I’ve just discovered and really like and need to listen to over and over again, just to keep it fresh, for a while anyway, then I better find some new music floating in a bottle. SP: What I’m enjoying the most is I find my system has a great balanced sound where no particular frequency oversteps or out shines another. The imaging and soundstage is solid with the help of some room treatment. The ceiling treatment has helped with the stability of the centre image. The music now has nice detail, a bit on the neutral side, but when I switch to Class A power the magic and a touch of warmth is added to all of that. TW: Have any other aspects of the sound been improved by the room treatment? SP: Yes, absolutely. Imaging particularly on vocals is better. And there’s a better sense of height and air in the recording. It’s also helped eliminate brightness. SP: Comfort and relaxation is what I want more of these days and this very much reflects the style of music I enjoy and the volume at which I play it at. To help recover from the grinds of life, I want to chill out listening to soothing material like folk and soft blues or anything that’s sweet on the ears. Escaping to some good music is a great way for me to unwind and clear my head, while the artists that tick all the boxes for me can be a cathartic experience. With our busy lives, I think we could all do with more of that. There are still times I like to turn the wick up on some rock and blues, though I seem to be doing that less and less these days. I’m pretty sure I exhausted my ears of loud music when I was young and stupid and having a pair of 801’s. I would listen at levels that had the windows rattling and the police knocking on the door. I guess it was all about being in the moment of my favourite track back then. TW: Do you find classical music to be soothing? SP: I suppose musically it is soothing, but it’s just something I can’t get into. I suppose folk music is something I find both soothing and interesting to me. Some movie soundtracks that build and take you on a journey can be more interesting to me than classical music. SP: I see it shrinking unfortunately if they don’t find a way to connect to the next gen of music lovers. It won’t be easy weaning them off their lossy MP3 files and ear buds that they’ve become accustomed to and accept as suitable sound quality. I don’t see many of them transitioning to high-end audio. If Apple does eventually offer hi-res music through iTunes, and once Neil Young’s Pono service comes online, then maybe the younger kids will get exposed to better sound quality. But it still depends on whether they care enough about it, and whether they hear a difference on their ear buds. As living space reduces and decors minimalise, products like the Devialet and high quality bookshelf speakers will probably be more sought after as high end products. 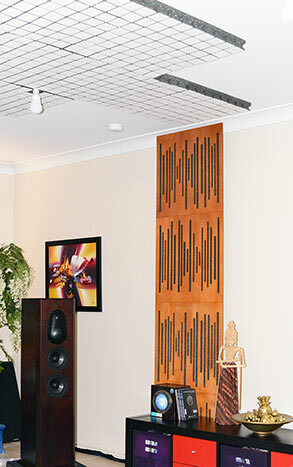 However I see many new home builders offering home automation and Wi-Fi hubs in their plans so for many people they will sadly just settle on streaming music through ceiling speakers throughout the home. SP: I’m with a lot of others when it comes to the poor sound quality of music these days. Perhaps the audio industry could get more involved with record labels or invest in them to raise the standards. There’s not much point shifting to hi-res music if the recording is poor to begin with. It will sound worse than MP3’s – kind of like seeing more skin imperfections in actor’s faces with high-definition video than we had seen previously with VHF/DVD. I guess the challenge will be to create WAF friendly high-end sounding products that don’t cost as much as buying a small country home or a luxury car.